Providing you the best range of CO2 from chemical reactions, CO2 generating plants, CO2 dosing systems, CO2 gas plants, CO2 storage systems and CO2 recovery plants with effective & timely delivery. Generating plants are based on the combustion of various fossil fuels including diesel oil, heavy oil, kerosene or natural gas. Through appropriate combustion of the fuel, scrubbing, stripping and separation technology, the CO2 gas plants meet the strictest CO2 quality standards. 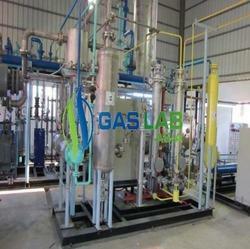 The CO2 gas plant is supplied with a special control panel that ensures continuous and trouble-free operation. All instruments installed on the skids are wired to junction boxes prior to shipment reducing installation and commissioning time on site. GASLAB provides application-oriented technology solutions for Carbon dioxide, built on the firm foundation of continual in-house and collaborative research along with decades of global experience. 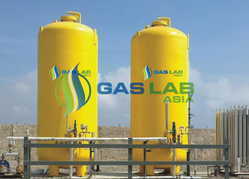 GASLAB offers the state-of-the-art CO2 injection system that provides highly accurate pH control. CO2 is a naturally occurring substance therefore safe and eco-friendly alternative to the mineral acids in pH control applications. pH control with Carbonic Injection System (CISx) finds applications at different stages in water treatment like the pretreatment stage, desalination post-treatment stage, re-carbonation stage, flocculation stage, and disinfection stage. GASLAB CO2 storage Systems are designed to benefit the requirements of the industries that do not own CO2 plants or their gas requirements vary with the operational speed. »Completely safe for bulk CO2 storage. Configured with modern safety devices, refrigerants, and insulators which prevent the loss of gas by evaporation and liquid CO2. Constructed from best and low-temperature steel and the fabrication process of these tanks is duly checked by internationally approved inspection agencies. Valves & fittings are approved by a controller of explosives. Polyurethane insulation and aluminum cladding are provided along with a magnetic level indicator. Refrigeration system is controlled logically and it maintains the temperature inside the tank. Many a time one has the requirement not to fill the big cylinders from the storage tank but to fill small cylinder / C02 extinguishers / cartridge from big cylinders. In such eventuality the revert gas is not important as the quantities concerned is not big. What is needed is accurately that the liquid goes into a small cylinder and semi automatically / automatically switched off the supply, as soon as the required quantity is filled in the small cylinder. The complete unit consists of a motor driven transfer pump, an optional for 27 kg supply cylinders and the necessary hose arrangements and valves to connect the pump to the supply and the necessary liquid must be supplied to the pump. If the supply cylinder valve connects into the vapor spare of the cylinder, the cylinder must be turned bottom up. The tilt rack serves this purpose. If the supply cylinder is of siphon type then the rack is not required. Such cylinder must be tied securely to a wall or post. The weighing scale is also included in the system. We are in the process of developing automatic system which enables to switch off the supply of C02 once the small cylinder has been filled with the desired quantity of the gas. CO2 extraction plants are based on the presence of CO2 in the gas sources from:- boilers and turbines, combustion engines, chemical processes and natural sources. Where an existing raw gas source with a relatively low CO2 content is available. A CO2 extraction plant proves an effective alternative to a conventional CO2 production plant. The CO2 plants work as testing ground to the innovations that we have developed in the recent times. We make sure of the performance of the process before making them commercially available to the clients. We are running CO2 plant also and hence we know the practical problem that come in running the plant and we can address them immediately as soon as any such problems arises with our customer. Enhanced Oil Recovery :A well is a very big hole dug in the ground. Sometimes it contains water, some times it contains oil and sometimes it got Carbon-Di-Oxide gas mixed with water. The oil wells turn to give sub normal output, after its continuous use. The Carbon-Di-Oxide injection helps in recovery of more oil from the well. The addition of Carbon-Di-Oxide gas through injection (of gas) some times gives extra oil by about 30-40%. The injection of Carbon-Di-Oxide does the following :Reduces the viscosity of the oil and allows it to come out and flow easily.The C02 gas mixes with the oil like water and the oil becomes carbonated and expands forcing the oil to come out of the tight openings in the rock and to waiting extraction wells The mixture of oil and Carbon-Di-Oxide also dissolves some rock thus making it more porous which results in more yield of oil.Since there is lot of Carbon-Di-Oxide which is used in the wells, therefore, the cost of Carbon-Di- Oxide is also to be considered. There is a talk of using C02 from the boiler flue gases after enrichment with a membrane. We supply co2 recovery from flue gas and co2 recovery systems. Since the quantity of C02 used in the wells is considerable and hence one can be sure of getting recovery. We design and supply CO2 gas plants that are based on various fuels, CO2 extraction and recovery plants. We export plants based on liquid fuels and natural gases, for places and countries where liquid fuel/ natural gases are costly. We make the plants on bio-mass. At S S Gas Lab, we have developed several plants running on Biomasses as we have perfect technology to extract CO2 from bio-mass..
We are constantly working on the designs of this plant based on fertilizer gases, breweries and distilleries to extract even more wealth from waste. 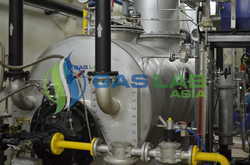 The CO2 gas plant uses boiler or any furnace flue gas as a raw material thus doing away with costly liquid fuel. The biomass gas plants can be designed in the different capacities ranging from 30kg per hour to 2000kg per hour. The capacities depend on the available input and can also be customized according to client's requirement. Other fuel options to run the plant include waste hard coke, nut coke, breeze coke and pearl coke. The CO2 gas plants are designed to utilize industrial by-products as their raw materials. In distillery plant fermented gases are produced in plenty and would go waste if not recovered. We recover odour-free, food grade CO2 from these plants. The bio-gas plants themselves are 100 percent pollution free causing no environmental imbalances.